NEW YORK, New York — Having served as Executive Director of Armenia Fund USA (US Eastern Region Affiliate) for over a decade, Irina Lazarian will become a member of the Board of Directors and assume a new position as Managing Director of the Howard Karagheusian Commemorative Corporation. The Foundation is active in Armenia, Karabakh, Syria, and Lebanon, implementing initiatives that help lift disadvantaged children and families out of the cycle of poverty and disease. During her tenure at Armenia Fund USA, Ms. Lazarian presided over the launches of many far-reaching nation-building programs on numerous fronts, including education and health care delivery, infrastructure, humanitarian aid and socio-economic development. She had overseen all fundraising and charitable operations and worked hand in hand with the Board: organized ten telethons, three phonathons and planned three anniversary galas. So it should come as no surprise that the board of directors of Armenia Fund USA sought her as their newest member. 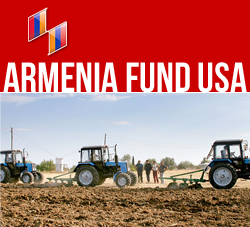 While Armenia Fund USA generates financial support as a primarily grass-roots organization, the Karagheusian Corporation is funded by a perpetual endowment from a single benefactor. This allows Ms. Lazarian to accept both posts without the potential for any conflict of interest. “Considering Irina’s accomplishments during her tenure at Armenia Fund USA, especially in the field of healthcare and education, she will bring a wealth of fresh ideas and expertise to her new position”, said Armenia Fund treasurer Aram Pehlivanian. As an example, Irina singlehandedly spearheaded the introduction of telemedicine to Armenia, which has grown into its own international physicians’ network under the banner of HyeBridge Telehealth. Using digital, videoconferencing and satellite-driven technologies, the system connects doctors from remote locations in Armenia and Karabakh to practitioners of Western medicine—in real time. Another important project of Irina’s is the Norman Miller Scholarship program for budding engineers and designers in Armenia. Leveraging her own engineering background, she will continue as a mentor and advisor to the scholarship recipients. Other projects include Meal and Meds program launched with the generosity of Meline Tufenkcyian for the TB hospital in Gyumri as well as the Neurosciences and Neurosurgical training program for the regional stroke center in Yerevan. Ms. Lazarian is a graduate of the State Engineering University of Armenia (SEUA) with a degree in Computer Science. She also holds a Master degree from the American University of Armenia (AUA) in Industrial Engineering with a major in Quality Control and Management. She moved to the United States in 1998 and became a U.S. citizen. Her prior work experience includes the roles of teacher and researcher at SEUA as well as customer services and human resources manager at HSBC/Armenia. Ms. Lazarian is also a member of various professional membership organizations as well as representative to the United Nations for Armenia Fund USA. She resides in Hoboken, New Jersey.